Every week we like to look back at everything we have read to bring you more information about the digital divide, digital inclusion and technology trends from around the web. Today we flash back to Airbnb & PowerOn partnership, our recent event at USC's Community Computing Center and highlighting our featured recipient in this edition of the weekly plug. human-I-T Donates To USC Community Computing Center This week we visited the University of Southern California Community Computing Center to donate 32 new computers for their lab. Our donation will help close the digital divide for low-income families, increase easy access to computers, and provide competitive class opportunities for children and parents of USC Community Education Academy. Learn more here about our impact and how you can help. 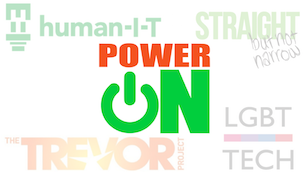 Flash Back Friday's: Airbnb & PowerOn Partnership Today we look back one year ago on our partnership between Airbnb and PowerOn (human-I-T, Straight But Not Narrow, LGBT Technology Partnership Institute & The Trevor Project) started working together. Watch how we support those in need with technology. How can you make an impact? Click here to learn more about our programs and see how you can help those in need by making a monetary or technology donation. Featured Recipient: Jespa Ngong Our featured recipient this week is Jespa Ngong, who hails from Cameroon and now lives in LA County. Learn more about Jespa here and see how you can help those in need stay connected.